You are here: Home / Investment Planning / How to transfer NSC from one person to another? Recently one of my blog readers asked me regarding transfer NSC from one person to another possible or not. Initially, I too of the opinion that it is not possible. However, he dig deep and provided me information that it is very much possible. Let us see the procedure and how we can transfer NSC from one person to another. Before proceeding further, let us go back and refresh our knowledge about what is NSC. I will try to highlight them as below. The minimum amount of investment is Rs.100 and there is no maximum limit. Available in denominations of Rs. 100, 500, 1000, 5,000, & 10000. Interest will be compounded annually. Earlier it was half yearly. This change was from 1st April, 2016. Refer the post “Post Office Savings Schemes -Changes effective from 1st, April 2016“. The interest rate for the current quarter (1st July-30th September 2016 is 8.1%. It will change on a quarterly basis. Individuals, Joint holders, minors can invest. However, HUF, Trust or NRIs can’t invest. But if a person was a Resident Indian at the time of purchasing the NSC and become an NRI during the maturity period, then he can continue holding the certificate till maturity. Investment done under NSC is available for tax benefit under Sec.80C. Refer my earlier posts for the same “Deduction under Section 80C – A complete list” and “NSC-Accrued Interest taxation and way to reduce it“. There will be no TDS on interest income. Certificates can be kept as collateral security to get a loan from banks. You can withdraw before maturity only in case of a) On the death of holder or any holders in case of joint holding, b) Oon forfeiture pledge by Gazetted Govt. Officer and c) When ordered by the court of law. Refer my earlier post for the same “Post Office Savings Schemes (RD, NSC, MIS, SCSS)-Premature closure rules“. As of now, you can invest in NSC through Post Office ONLY. However, recently Government notified that NSC and KVP be available in e-mode and passbook mode. But banks are not listed for NSC issuance. Refer my latest post on the same “NSC and KVP in e-mode and Passbook mode from 1st July 2016“. Now let us concentrate on the topic of this post. 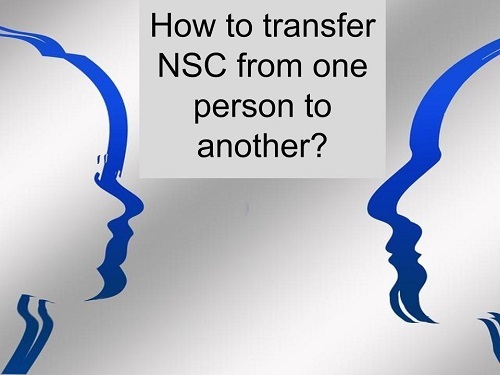 Many of us don’t know that transfer NSC from one person to another is possible. Below are few points to know before jumping into the transfer. # You can transfer the certificate at any point of time from the date of issue to date of maturity. # You can avail this facility ONLY once during this period. # Post Master or Head Post Master’s consent is a must for transfer. # Transferee must be eligible to buy the NSC as per rule. # Transfer is permitted for whole amount but not partly. # After transfer again it can be transferred to the original holder. But same rule of transfer applies. # After transfer you will receive a new certificate in transferee name but the date of investment will be the original date of investment. When the transfer of NSC from one person to another is possible? a) From the name of a deceased holder to his or her legal heir. b) From the name of NSC certificate holder to the court of law or to any person under the orders of the court of law. c) From Joint Holders of NSC to the name of the joint holders. d) Transfer to the relative with love and affection. Near relative means, husband, wife, lineal ascendant or descendant, brothers or sisters. # You have to fill NC34-Transfer form. # Both transferor and transferee must sign the form. # Transferee must complete the KYC process as a fresh investor. Hope this much information is enough. Sheeba-Who said there is a TDS? —>Will they charge extra for this. —> If I transfer it to them, If they are below 3L income, will they have to pay tax for the interest. d) Whatever be their taxable income range, interest on NSC is taxable.